I had a hilarious morning today, now that I look back on it - and it really didn’t phase me when it was happening, although it might have bothered me earlier in my sales career. I thought I’d relate this story because I’m sure you’ve probably had something that has challenged you in your sales or marketing career, where compounding events have conspired to prevent you from being successful, but you came through under pressure and delivered your best anyway. 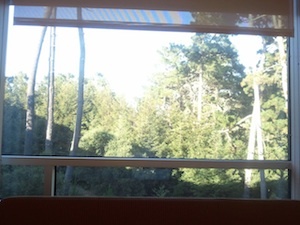 The photo is the view from my bed, taken last Friday in hospital recovering from surgery for a collapsed lung. I got home from hospital on Saturday and have been working from home in the mornings and resting in the afternoon; it’s relevant background for the story to know that I’m not 100%, while this story unfolds, (when you are a consultant working from home, you never stop working). About a month ago, I received an inbound WhiteboardSelling lead on my HubSpot Inbound Marketing system from a marketing manager in an important "brand-name" technology company and after several email exchanges, we set this up this morning’s 9AM meeting, prior to my prospect going on long leave. Yesterday, I received a note in the mail from the power company that there was going to some urgent overhead cable work and there would be a power outage in our area from 7AM-3PM today and to plan accordingly. It was too late to change our meeting as the prospective customer lives in Europe so I decided to try one of the local hotels to see if I could use their foyer for a breakfast meeting and access their WiFi. I’m a member of a sports club associated with the hotel, so the Inn at Spanish Bay kindly accommodated my need for WiFi for my breakfast meeting and I set myself up on a sofa and coffee table in a quiet corner of the lobby, next to a fireplace and adjacent to the piano. I needed a table to rest my computer on, so that I could see the screen while I was doing the WhiteboardSelling discovery and demonstration session using a digital pen and paper called “ Paper-Show”. (Paper-Show is a fantastic tool that enables me to whiteboard very effectively over Webex, or any other Web conferencing tool; for $180, its one of the most valuable sales tools I’ve ever used). Since I was using the sumptuous hotel lobby for the meeting, I could hardly grumble or ask them to turn the Musak down which consisted of smooth swing jazz vocals from Ella Fitzgerald, Frank Sinatra, etc….but it was there and it was a distraction. Another problem was the cellphone reception; where I was in the hotel, I could only 1, 2 or no-bars and I dropped connection twice waiting for the call to start. Fortunately the phone worked perfectly for the whole call and my Bluetooth headset had enough charge in it to continue for the work….I had the phone charging overnight, but forgot to charge the headset. The presentation was going well until a couple of guys from hotel facilities came over with a 60” TV on a stand and put it next to my sofa, then stood around and started scratching their heads and then began climbing around me. I offered to move and had to get up while they moved the sofa and wired in the TV and this took longer than it should, but that’s probably my imagination. Meanwhile I’m listening and whiteboarding, but I can't see the screen. The presentation was going well, great dialogue, learning lots about the client situation and it was running over the hour, which wasn’t a bad thing. Next thing, this guy with a meter of some sort and a toolbox comes past and plonks himself down at the piano about 10 feet away. I continued with the presentation and looked up when I heard the piano going, - he was the piano tuner….and it was my lucky day. I’m pleased to say that the Webex went well, we have a positive set of action items and despite the challenges, the outcome was positive. I’ll let you know who the prospect was if we get to do business and they allow me to mention their name. 1. No matter how serious life appears to be, we shouldn't take ourselves too seriously…its never a bad time for a laugh. 2. If you're in sales or marketing and planning a kick-off training event next year, then you might want to think about DOING some WhiteboardSelling training.